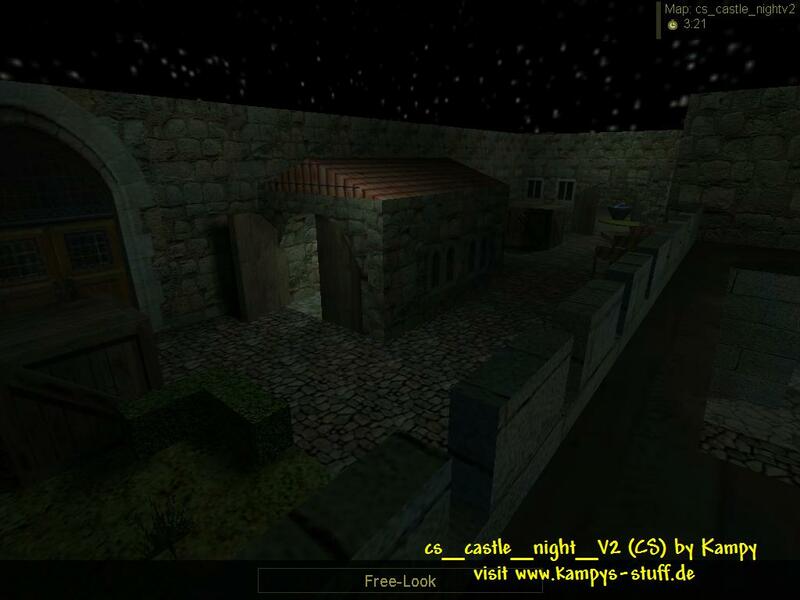 The theme of cs_castle_night can be seen in it's name: it's a castle at night. You can't actually walk into the castle it plays on the outside of it mostly. The map is devided by a river with two bridges. From the view of the bridge which is not passable the left side of the map is where the Counter-Terrorists start. There is a garden which is surrounded by high walls and in the middle there's a kind of entrance building which seperates the garden in two parts. The river flows under the two bridges and after that under a part of the castle. The river can only be passed by using the bridge or walking through this building. On the right side there is the Terrorists' base. The right side is completely blocked through a high wall where only a big open gate leads through which is at the end of the bridge. The Terrorists' base consists of a market with some booths and a sword store plus the castle entrance with a defence wall. If you walk through the building under which the river flows you pass through a collapsed chamber where you can climb up a bed which is stuck between rubble. There's one door leading to another room with a table and two chairs which is open at the other side it. At the open side there are stairs leading down to the Terrorists' base. There's a fountain and a broken gate which leads to the market place. All in all the grafic looks good, there are no errors and it has a nice castle atmosphere. There are three hostages in this map: one at the fountain and the other two at the defence wall locked up in small cells. The gameplay is like this: the Counter-Terrorists can access the roof of the building in their base and with it the high walls either through the crates, a broken part of the wall or a plant next to the well in their base. From there you can perfectly give covering fire when the team members try to storm the castle through the bridge. Using the bridge is quite dangerous though. There are always Terrorists standing near the big gate on their side and a use of flashbangs and smoke grenades is a good choice. The other way through the passable part of the castle is good for three things: helping the bridge users by giving covering fire through the windows through which you can look at the bridge, rescuing the hostage near the fountain (in the collapsed chamber begins the rescue zone already!) and its perfect for attacking the camping terrorists from the backside. You have a good chance of rescuing all the hostages if you rescue the single one at the beginning of the round. The terrorists have a lot of camping positions for example in their base at the defence wall or the sword store. Of course you can also use the part of the castle as a terrorist to attack the hostile snipers from behind or through the windows. The gameplay is absolutely balanced and great fun it you know all the tricks. 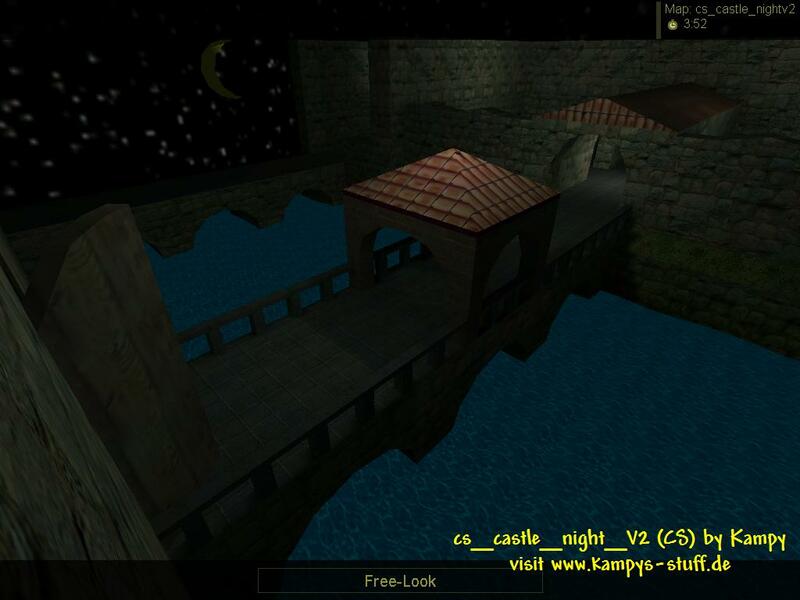 For a counter-strike map castle_night is pretty small and I recommend you play it with 6 players at max. A small problem might be the r_speeds (reach 1000 at a few positions) if you have an old computer it might be a little slow at some parts especially the CT-base with the sniper positions. I havent had any problems yet though. This is my favorite custom Counter-Strike map and I love to play it. Download now! 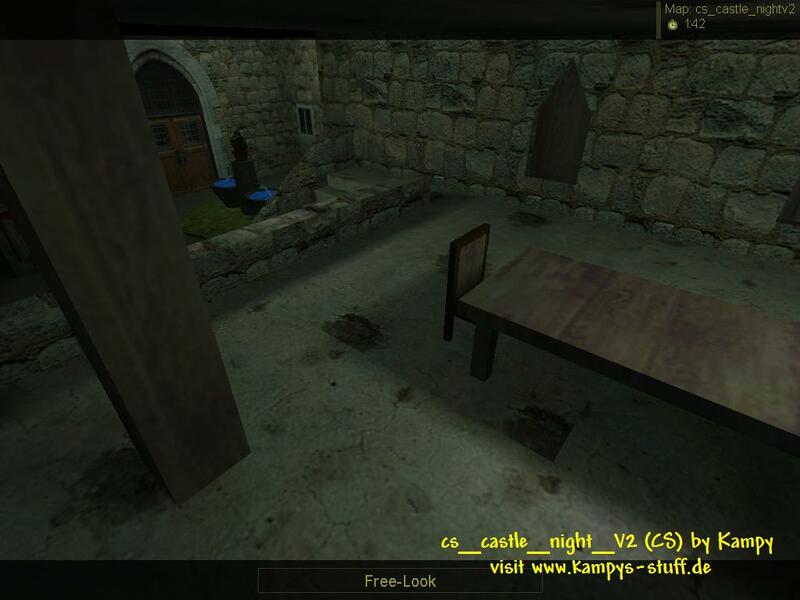 - you can jump from the wall in the CT base into a window of the passable part of the castle, but dont fall down!